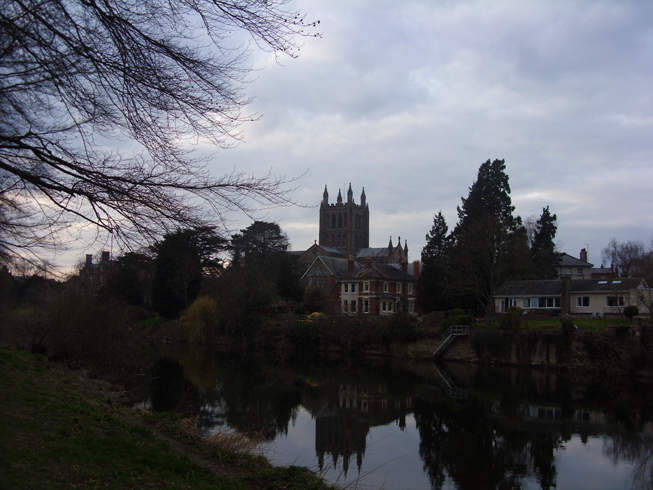 After a ducktastic start to our damp bimble in Wye Walk – Part One, here we are trundling along the tree lined banks of the River Wye in Hereford City. On our right is Hereford Cathedral, home to the chained library and Mappa Mundi. The skyline and river reflections are dominated by its medieval tower, 218 steps or 43 metres of it. A recent archeological dig in the Cathedral grounds has revealed a possible 9th – 10th century Saxon Palace along with the remains of Saxon burials. These include a Saxon child and a possible Norman knight; more details here. I have already mentioned the links between the composer Edward Elgar and Hereford in Urban Bimble Part Two. 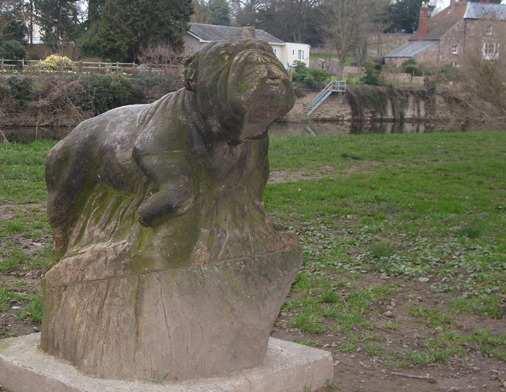 He crops up again with this sculpture of a bulldog carved from a tree stump. The hound in question is Dan, pet of the cathedral organist George Sinclair, during Elgar’s time. Elgar’s 1899 composition, “Enigma Variations” consists of 14 parts, each inspired by someone he was attached to. Number Eleven is dedicated to Mr Sinclair and an episode whereby Dan the bulldog falls into the River Wye. Not renowned for being water dogs, Dan nevertheless manages to swim upstream and scramble back up onto the bank, whereby he gave a triumphant bark. George and Dan were apparently inseparable and Elgar was very fond of them both. You can listen to Elgar’s Enigma Variations here, the relevant one is XI GRS. As to what the “Enigma” actually was, we shall never know. How enigmatic! Now we come to an old bridge, creatively named “The Old Bridge”. The original crossing would have been a wooden one, a stone bridge was erected around 1100. This was rebuilt in 1490 and widened by the Victorians in 1826. 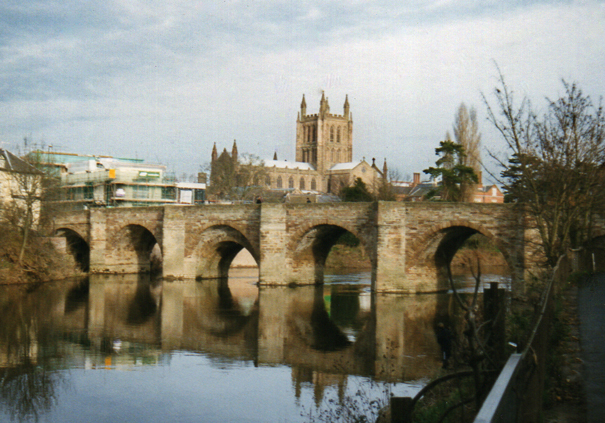 Until 1782 it had a gatehouse, Hereford being a walled city. During the English Civil War, Hereford was on the side of the Royalists; that is the rich important people of Hereford were on the side of the Royalists, the ordinary peasants weren’t asked their opinion. In 1645 the Scottish army fighting on behalf of the Parliamentarians laid siege to Hereford. The Scots were under the command of Alexander Leslie, the Earl of Leven who complained about the state of Herefordshire roads, “… the Army is not able to march above eight miles a day, though they begin to march at the Sun rising, and continue till ten at night ..” – so not much change there then. 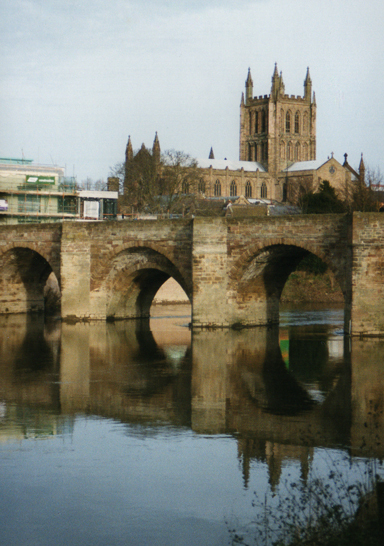 The Scottish cannon managed to breach the wall, but the people of Hereford took stones from one of the arches of the bridge to repair the damage. This is why the rebuilt arch is different to the others, can you spot which one? The Scots eventually tired of the place and went home. The Parliamentarians won the war, although the monarchy was later re-established with diminished powers (this is why Prince Charles’ letters lobbying the UK Government are considered controversial today). Part of the old wall still stands today with a Scottish cannon ball embedded in it. 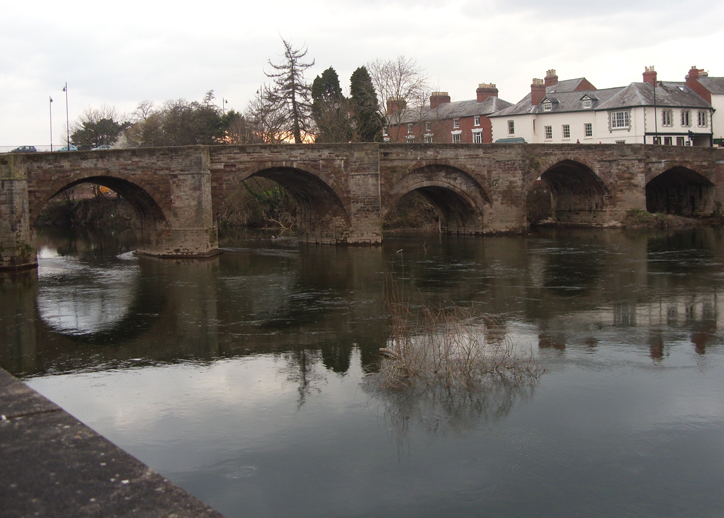 Hereford did eventually build a second transport crossing over the Wye in 1966, it is called … wait for it … The New Bridge. Actually it is officially called Greyfriars Bridge, but we yokels are easily confused. If we cross the road and continue along the little footpath, we get a nice view of the other side of the Old Bridge with the cathedral behind it. These two photos were taken on a sunnier day some years ago. Well it has been a bit of a dank and dismal day, hence the poorly lit photographs. 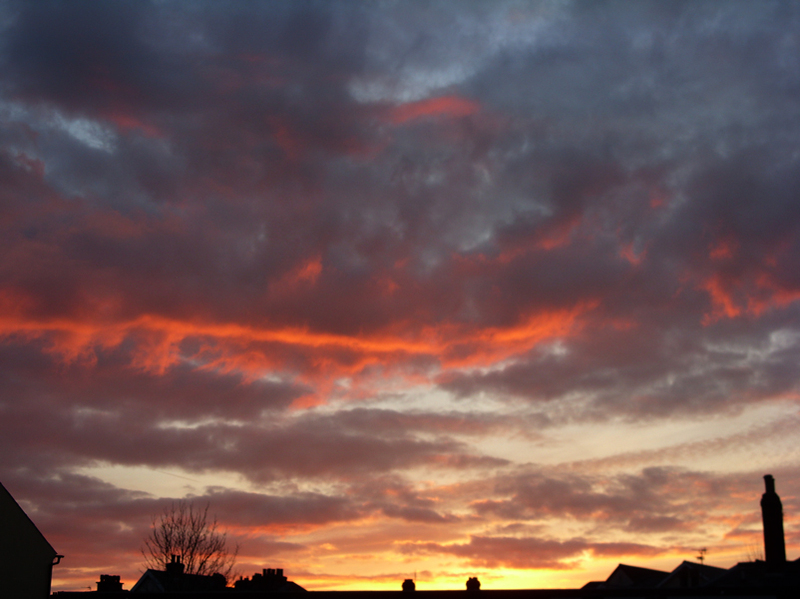 However, we are rewarded with a lovely sunset as we head for our favourite fish and chip shop on the way home. For my American readers, chips in the UK are nice, fat, greasy fries and an excellent way to replace any calories we may have lost while rambling. If you are very good I may take you for a short bimble up-river later. This entry was tagged Dan the bulldog, Edward Elgar, English Civil War, Hereford, Old Bridge, River Wye. Bookmark the permalink.